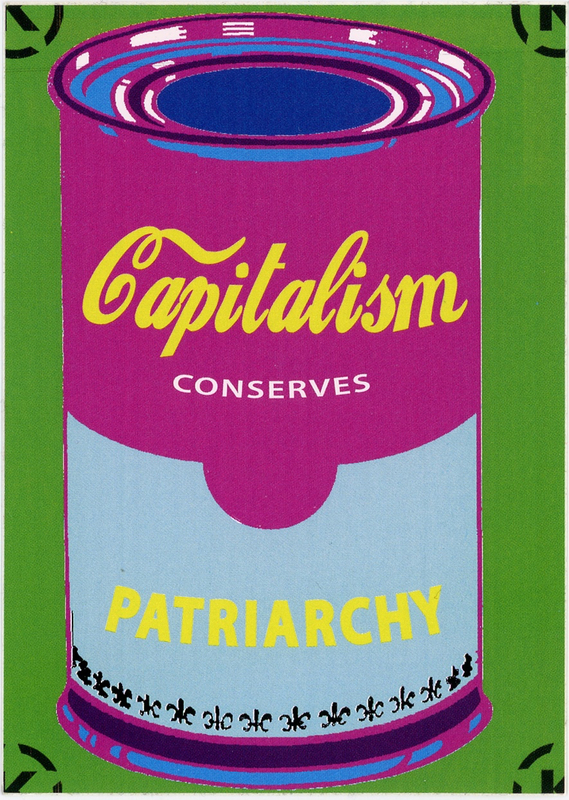 This sticker plays upon Andy Warhol’s iconic Campbell’s Soup cans but replaces the label with the statement “Capitalism Conserves Patriarchy.” Patriarchy is the systematic institutionalized power that men carry in society. Capitalism refers to an economic and political system in which private owners control a nation’s trade and industry, for profit. In feminist theory, the relationship between capitalism and patriarchy reveals that successful capitalist development and diminishing gender inequality go hand in hand. This is partly because white, wealthy men dominantly control government and big business. The theory demonstrates the intersection between gender and class in systems of inequality. The Campbell’s Soup can reference also speaks to gender and capitalism. The Any Warhol Soup Cans resemble mass-produced, printed advertisements and mimics the repetition and uniformity of consumer culture. Ironically, Andy Warhol exemplifies the long history the art world dominated by men. The sticker both comments on the patriarchy of consumer culture and art history. This sticker exemplifies a “culture jam,” in which an artist subverts a preexisting symbol to alter its meaning.